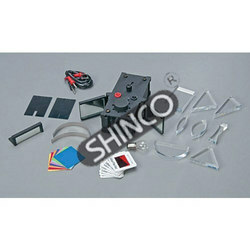 With our vast industrial experience, we have came up with a wide range of Light Optics Instruments. 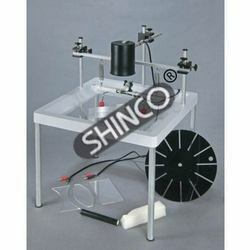 These products are extensively used to wither process light waves in order to enhance an image for viewing or analyze. 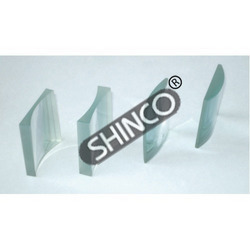 The light optics instruments are easily available in various thicknesses and diameters as per the application requirements of our esteemed clients. 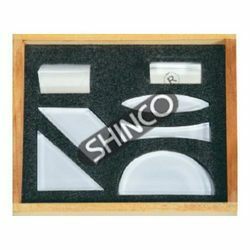 In this range, we have Optical Bench, Acrylic Prism And Lens Set Of Seven, Advanced Spectrometer, Advanced Spectrometer and many more. 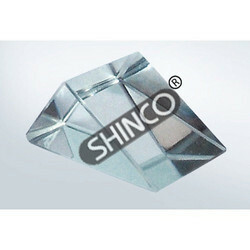 Leveraging on the support of our industry experience, we are able to come up with Prism, Equilateral, Mounted. Adjustable in height, the offered range can be rotated on its own axis by 180º or locked at an angle. 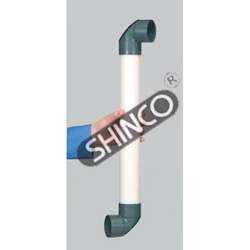 Our experienced professionals manufacture these quality products using quality material and other essential components that are required for the production process. 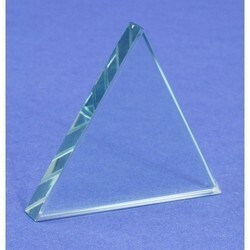 With an aim to stand tall on the expectations of patrons, we are engaged in offering Prisms. These products can deviate a ray, disperse white light into the visible spectrum or erect an inverted image. 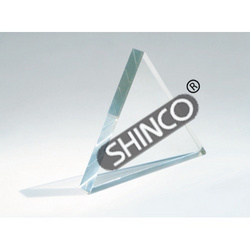 Right angle prisms 90º-45º-45º are extensively used for accomplishing a 90º bend due to total internal reflection. Our quality controllers thoroughly examine these products on certain well-defined parameters of quality to ensure flawlessness. 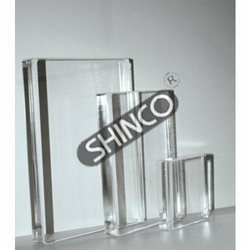 With the help of our sophisticated in-house facilities, we have been able to offer an array of Glass Cylindrical Lenses. 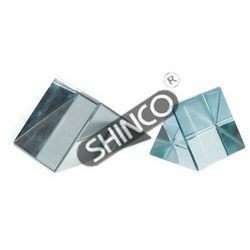 Precisely manufactured, these products are developed by making use of optically true glass with polished faces and ground edges. To focus light along a straight line, these quality products are widely useful for looking at full paths of ‘rays’ on paper such as pencils of light emerging from the slits of a comb illuminated by a small lamp. 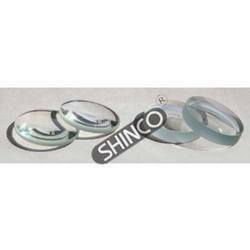 Backed by rich industry experience, we are engaged in offering an excellent range of Glass Lens, Demonstration Set. 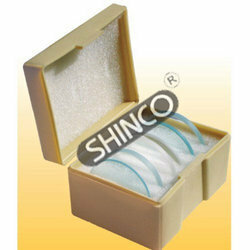 Our professionals make use of high quality raw material that are obtained from the most trustworthy vendors of the industry. 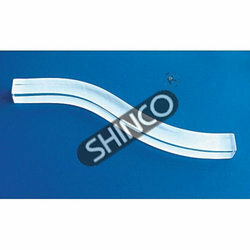 Precisely manufactured, the products we are offering are known for its high efficiency and premium quality. 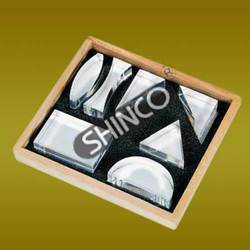 Backed by a team of dexterous professionals, we have been able to provide the customers with a remarkable assortment of Spherical Unmounted Lenses. 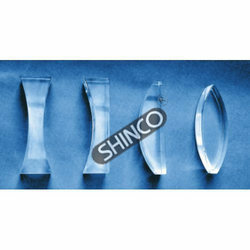 Designed and developed using polished glass with ground edges, our quality products are bi-convex lens that magnify or condense spherical unmounted lenses, with two outward curving symmetrical faces. Diameter Focal Length(+) Cat. No. 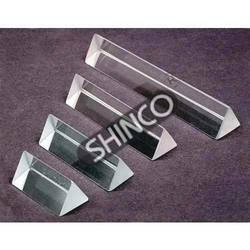 Owing to the dexterous professionals, we have been able to provide the clients with a commendable assortment of Acrylic Prism And Lens Set Of Seven. 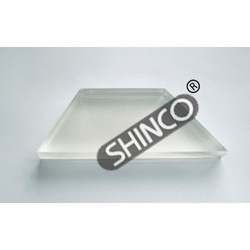 Our quality products is dedicatedly designed using excellent quality raw material that are obtained from the trustworthy vendors of the market. 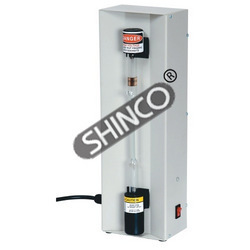 For measuring critical angle and observing total internal reflection. 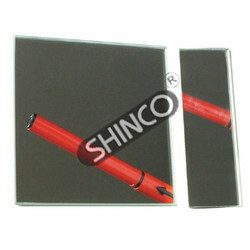 Made of clear optical glass. waves and small bubbles. The sizes are approximate only. For studying the laws of optics. Made of 15mm thick and 32mm wide with two parallel sides 90mm and 40mm long at angles of 45º and 60º . One large surface is frosted enabling to follow the path of light. To verify the laws of refraction. 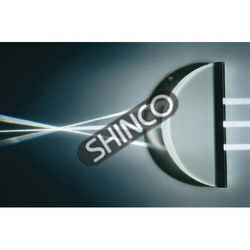 For optical experiments sold in pack of 100. 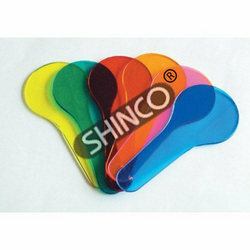 Diameter 60mm and thickness 15mm. edges: 1 rectangle, 1 triangle 600-600-600, 1 triangle 900-600-300, 1 triangle 900-450-450, and 1 semi circle. B. Three Perspex, cylindrical lenses: 1 double convex, and 1 double concave, both with the same radius of curvature; and 1 thick double convex. C. Three mirrors, freestanding: 1 plane (mounted), 1 semi-circular metallic, and 1 parabolic. D. Two slit plates, metal, matte-black: one with three narrow slits at one end, and one narrow slit at the other; the other with four narrow slits at one end, and one wider slit at the other. E. Eight color filters, mounted: 3 primary and 5 secondary colors. F. Eight color cards, mounted. 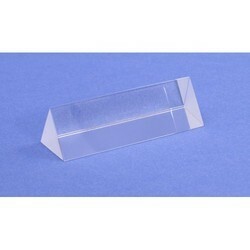 An S-shape acrylic bar 220x15x15mm, which can be used to demonstrate total internal reflection and help students to understand the principles of optical communications. The bottom of the bar is painted white to aid visibility. Length x width Glass Cat. No. Plastic Cat. No. For studying interference fringes due to sunlight or monochromatic light. 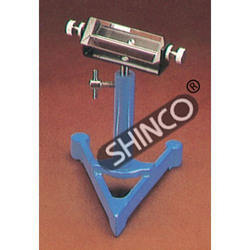 Consist of a plano-convex lens, diameter 60mm, and an optically polished (worked) fl at glass plate mounted on a ring metal pressure frame with three compression adjusting screws for proper centering of concentric circular Newton rings. Periscopes, including this one, can help you see around barriers. But what if you want to see something behind you? Submarine periscope operators walk in circles, turning the whole periscope. Why not just rotate the top mirror? Try it with this rotating periscope, and you’ll see that the image of everything behind you is upside-down! An elegant demonstration of basic plane mirror reflection, this is also a great way to test student understanding of image formation. For optically slowing or completely “stopping” any object in motion and for “measuring” the frequency of periodic motion. 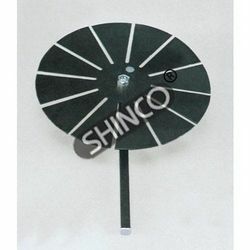 Consists of a black metal disk of 250mm diameter with 12 evenly spaced radial slits extending to its edge, an axis hole for mounting a handle and a finger hole. 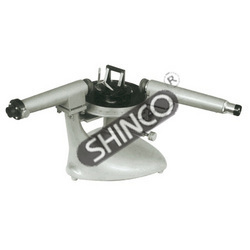 Handle and mounting screw are included. 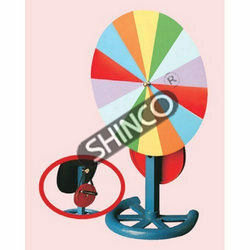 Demonstrates that white light is composed of seven colors by rotating hand-driven wheel. Constructed of sturdy metal. To show spectral lines of pure substances. Mercury and Helium tubes can be used as sources for experiments on the measurement of wave length of light. The gas pressure used results in well-defined emission spectra. These are glass tubes about 26cm long, central capillary portion about 9-10cm long with electrodes sealed at both ends and connected to lead wires protected by metal caps. Provided with loops welded to caps for electrical connection. Needs an induction coil 5cm spark, or a suitable transformer. Except for Neon and Helium, these can not be used as lamps. Length of capillary portion can be varied as required. For intermittent use. A replicate grating pressed between clear glass plates. Ideal for classroom demonstration. View area: 25mm x 25mm. View area: 45mm x 30mm. with two inward curving symmetrical faces. Diameter Focal Length(-) Cat. No. Dimensions: 90mm long and 15mm thick plate. Bottom surface is frosted. Dimensions: 60mm long and 12mm thick. Bottom surface and both edges are frosted. Diameter Focal Length Cat. No. 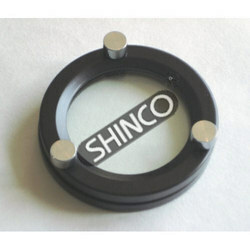 Can hold lens upto 75mm diameter. 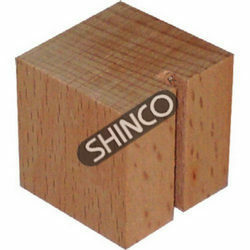 Hardwood cube with slot to hold mirror strip vertically. Side 32mm. 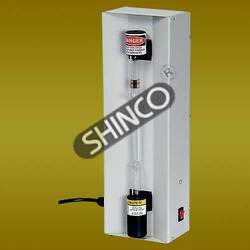 Over the years of experience in the industry, we have been able to provide the customers with an astounding assortment of Power Supply For Spectrum Discharge Tubes. Specially designed, these quality-approved power supply are used to safely run spectrum discharge tubes of length approximately 26 cm. Encased in a metal body, our offered range comes with clips to connect the tubes securely. 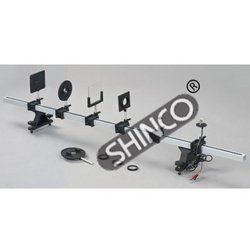 With the aid our competent team of professionals, we have came up with a wide range of Optical Bench. 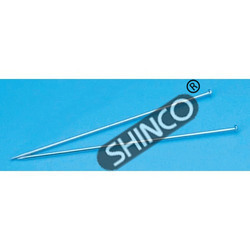 The high quality material that are used in the production process is obtained from the reliable sources of the market. Designed & developed at our state-of-the-art infrastructure premises, our products are widely appreciated amongst the patrons.